My journey down the roads and trails with little or no shoes. Also, a bunch of other rants as they hit me. This weekend, my friend Trisha (barefootmonologues.wordpress.com) posted a small status update on Facebook wondering whether she had the chops for a 50Km Ultra. She tagged all of our mutual FB friends who were either already Ultra runners or aspiring Ultra runners. Clearly this was a passive aggressive (probably the wrong term) way to get people to push her into signing up. I was tagged as part of this and promptly started in with everyone else trying to get Trisha to take the leap. I've personally been toying with trying an Ultra as well so somehow I managed to commit to running this thing too. The race we signed up for is the Pineland Farms Trail Festival 50Km. Yes, that's right, I willingly signed up to run 31miles through the woods of Maine. My family thinks I'm batshit crazy but how crazy could I really be if as of this writing I know of at least 10 people who are or are planning to sign up for this. If everyone around me is doing it, we can't all be crazy, right? I have absolutely no plan for training at this point. My only plans are to have fun, party, hang with a bunch of cool people, and drink some beers. Smuttynose Brewing is a sponsor and will be giving free beer to all runners. Who's crazy now? ha! Oh, and the finisher medal is a cowbell and you always need more cowbell! Way back in December, Jason Robillard, barefoot running nomad and all around great dude, posted a picture of a bunch of shoes on Facebook. I jokingly stated that I'd be happy to take some of them off his hands since he and I are the same shoe size. It turns out that Jason was in fact looking to lighten his load of review shoes. His philosophy is to pay it forward to others to keep the message going so I enter a "shoe draft" with 3 other dudes who are lucky enough to be Jason's shoe size. In my draft slots, I chose the 4mm Invisible Shoe huaraches and the Merrell Road Glove which is the new minimal road shoe from Merrell. Several bloggers have posted reviews on the Road Gloves and I will also review them more thoroughly after a few more miles. Today, the mailman finally delivered a package that I've been eagerly awaiting since Christmas time. 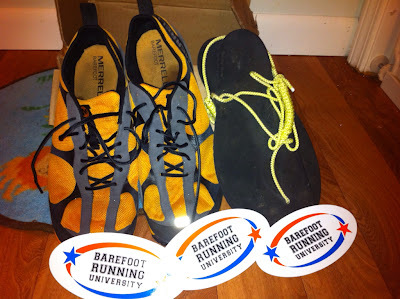 Upon opening the box from Jason, I found the shoes and some Barefoot Running University stickers which you can bet will make it onto my car. The Road Gloves are Dark Cheddar which is pretty much orange. They are very much in your face which is how I like my running shoes since I'm an attention whore. Unfortunately, my floor makes them look even more cheddary but at least the flash brings out the reflecty thingie for you to appreciate. I've been running in Merrell Trail Gloves for a year (see my review here) and the feel of the Road Glove was very similar. They are built on the same last and have very much a similar fit. The Road Glove has a traditional lacing system as opposed to the Omni-Fit™ system used on the Trail Glove. 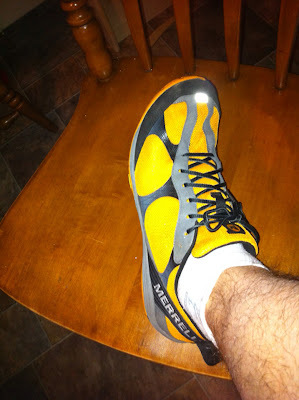 The shoe is very flexible as I would expect from a Merrell Barefoot shoe. The big difference is obviously the sole. Where the Trail Glove has a sticky feeling Vibram sole with fairly aggressive tread, the Road Glove seems to employ a harder Vibram compound with a less aggressive tread tailored for roads. The upper is the same microfiber sockless liner from the Trail Glove though I tend to wear socks if for nothing else but to put up a stink barrier between my feet and the shoe. The upper is a very light breathable mesh. It was crappy and slushy here in New England today but I needed to get these things out for a run. I've been pining over these shoes since the fall. The lack of the Omni-Fit™ lacing is the first negative I noticed when lacing up. I really love the fit you can achieve with Trail Gloves and I attribute that mostly to the lacing system. It's not as important on a road shoe but I like the custom fit that the Trail Glove gives me. The second thing that I noticed was a pressure on my right medial arch. That's a shoe geek way of saying the inside of your arch. 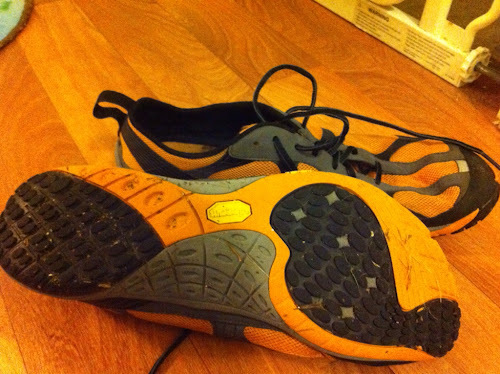 This is a widely reported issue with the Merrell last and I have experienced it with all of my Merrell shoes to date. Fortunately, for me this pressure subsides after I've used the shoes for 20 miles or so as it forms to my foot. My footing was exceptionally sure today despite puddles and slush at every step. The shoe performed really well in the slush from a grip perspective. My feet, unfortunately, did not stay dry as the Road Glove is about as breathable a shoe as you can find this side of a pair of huaraches. I'm cool with that though because my feet stayed warm from running and I was not expecting the shoes to keep me dry at all. After 3 miles, I know these will be in heavy rotation as my road shoe for the foreseeable future. They will probably also be a casual shoe too so I can keep the attention whoring going outside of running. Thanks again to Jason for the shoes! These are the shoes that I'm most excited about for this season. I'm a 40 year old dad, husband, runner, engineer, and general geek. I've been running for fitness for a few years. 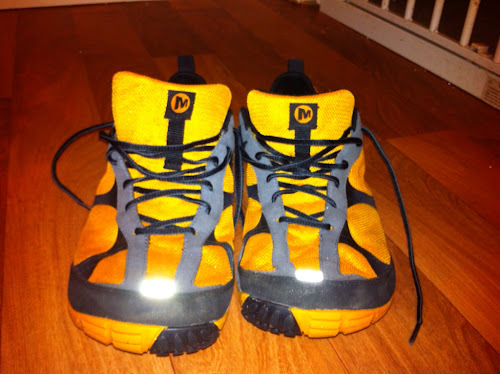 In July 2010, I bought Vibram Five Fingers. From there I tried barefoot and I haven't gone back to big old heavy running shoes since. 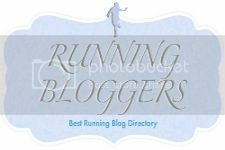 I've found joy in running! Parkour looks fun or "My next midlife crisis?"